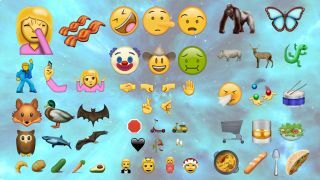 A picture is worth a thousand words, so prepare for your vocabulary to explode with the addition to 72 new emojis planned for Apple owners. Teased over the course of this month, the final collection of the upcoming batch of smilies was revealed by Emojipedia, presented in the "Apple style" that give us an idea what they will look like on iOS devices. The Unicode Consortium - which develops and approves emoji designs, among other computer language standards - released the new icons yesterday. However, it will still be some time before its fully incorporated for iOS, Android, and other popular platforms and devices. With the advent of iOS 10 around the corner, we wouldn't be surprised if these emojis come as part of Apple's big update this fall - if not very closely after, 9to5Mac theorizes. Plans are already in motion to include the new icons with Android's anticipated Android N update, which is expected out later this summer. Either way, we hope the wait is short so that we can finally be able to send some hella sweet fist bumps over text. We're not as hyped about that creepy clown face, though.